I don't know. The Craft Fair at Winchester loomed large for months and I thought I'd never be ready and then, "whoosh" it was all over. 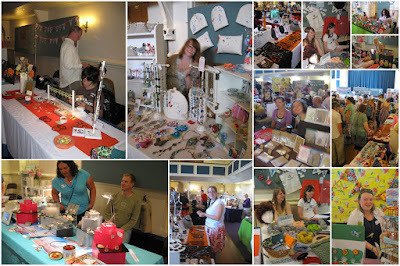 Here's a collage of some of the lovely stalls and even lovelier people at the sale. Alice of Raspberry Fairy did a fabulous job orgainising it all. Can I send a "Thank you " to everyone who came over to say hello and biiiiiiiig huuuuugs to those who bought some Quercus on the day. Hi Su, it was really lovely to meet you on Sunday. Im sorry to pounce on you but me and laurence were both so excited to talk to you and to see your work in 'real life'. I bought one of your opaque pink bangles and havent taken it off since, it is so lovely to wear. The promised link to my blog is amyrwyatt.blogspot.com theres some photos there of my fmp work and hopefully some more in the future. I hope the rest of the day went well for you, your husband and son made very friendly stall holders.